This is an impressive little dish for an intimate dinner party, hence the quantities given in the recipe. Serve it as a starter for two, or double the quantities to make it a main course. The morel is a reassuringly expensive dried mushroom with a unique texture and exquisite flavour. If you cannot find/afford morels, any variety of dried wild mushrooms (oyster, shiitake, maitake, etc.) should be sufficient. Swiss Deli Veal Bratwurst are made for this dish, however, you could also easily use Swiss Deli Weisswurst. 1. Place the mushrooms in a small bowl and just cover with boiling water. Leave them to soak for 30 minutes, remove from the water and set aside. 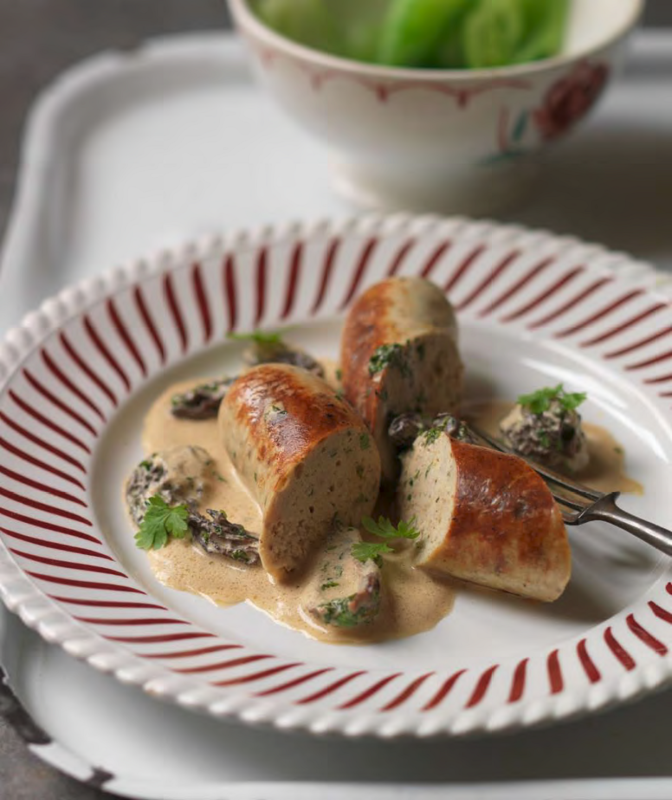 Reserve the liquid – it will have absorbed delightful mushroom flavours and you will need it later. 2. Gently fry the Veal Bratwurst sausages in the butter very slowly for about half an hour, turning occasionally. 3. While the sausages are frying, make the sauce. First, slice the mushrooms and lightly fry them in 1 tablespoon butter for five to eight minutes. Add the water you soaked the mushrooms in, taking care to omit any grit, plus the wine and chicken stock, and reduce rapidly until the sauce has become gelatinous. Throw in the parsley or chervil and crème fraîche, simmer for a minute or two, and the sauce is ready. 4. Serve the sausages with the sauce poured over, with delicate Chinese greens such as pak choi.